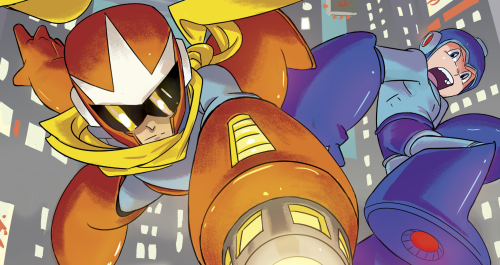 “Proto-Type” Part Two: The origin of Mega Man's wayward brother, Proto Man, continues! 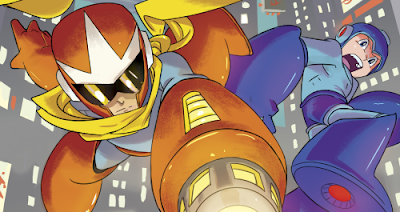 What happened to the robot named “Blues” after he left Dr. Light? And how did he make is fateful encounter with Dr. Wily? Then, in “Cold Feat, ” Guts Man comes to Ice Man's aid, but is the buff robot the bigger threat? Script: Ian Flynn Art: Chad Thomas, Jamal Peppers, Gary Martin, John Workman, and Matt Herms Cover: Mike Norton Variant Cover: Sanford Greene On Sale at Comic Specialty Shops: 10/10 32-page, full color comic $2.99 US. You can check out issue #18's covers in all their hi-res glory at Capcom Unity. are they seriously going along with this COVER?! i mean this looks horrible....... -_-"
I am really looking foward to this arc. :D I just hope the art within the pages are good. Yeah, this is the first cover I've just been unable to enjoy. Chad's early variant cover for the first issue was a little off, but with his track record of really improving I can easily let it slide. This? This is just bad. I mean, it's really amateur and that's surprising considering the talent we've seen so far. This is the first issue that I think will get to side behind my variant issue instead of in front.